Gorakhagd is a small fortress in the Murbad region. It has a twin fortress of Macchindragad next to it. 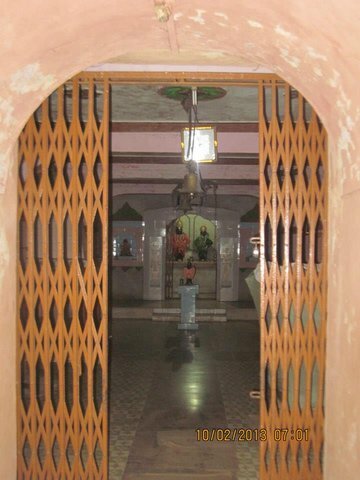 The names of the places are derived from the teacher-disciple duo of Gorakhnath and Macchindranath, who are known to have used these places for meditation. The fortress served as a sentry/watchtower over the Ahupe-Khopivali Ghat and the Murbad Region. Legend has it that Shivaji stored the loot of Surat at Gorakhgad for some time before shifting it to the capital. 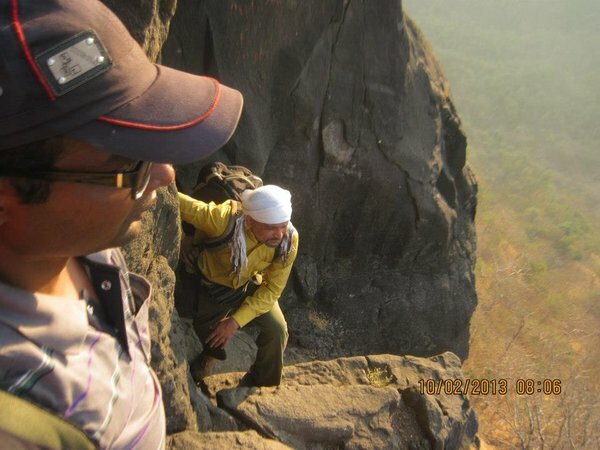 The main feature of the Gorakhgad trek are the two rock-cut staircases which spiral around the pinnacle. 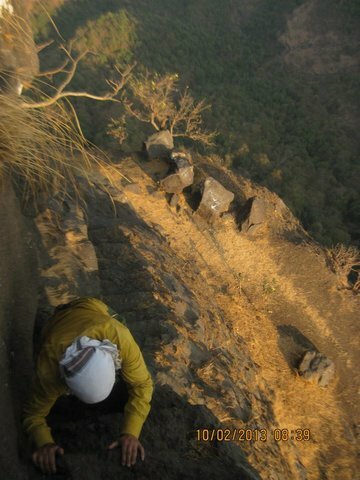 The caves of Gorakhgad are located at the end of the first set of stairs. The initial stairs of both the staircases have been destroyed by the British during their conquest of the fort in 1818. This makes climbing the stairs that bit more difficult while providing stunning views of the valley. From Mumbai, get on the Kalyan-Ahmednagar highway. After crossing Murbad turn right for Mhasa. The wall of the Deccan Plateau will be on our left at the start and at the front by the time you reach Mhasa. Take a left here such that the plateau is to your right. Alight at the village Dehri. 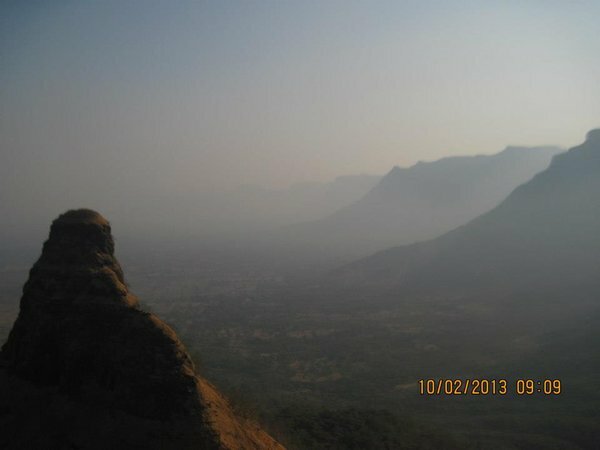 The twin pinnacles of Gorakhgad and Macchindragad can be seen from Mhasa itself, but are to be accessed only from Dehri. The total distance from Murbad is about 25-30kms. An alternate route also exists from Saralgaon. After reaching Dehri, make way to the Vitthal-Rakhumai Temple. 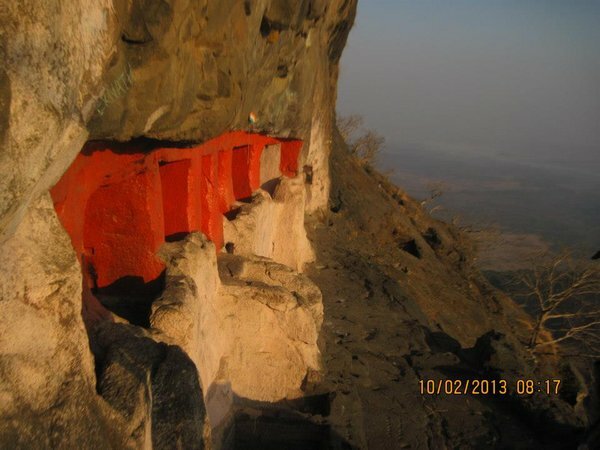 The route to Gorakhgad goes from behind this temple. The route is very prominent right till the end. 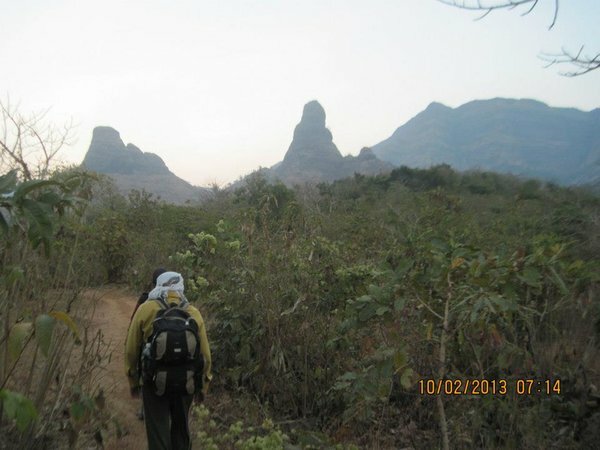 Initially we ascend a small hillock which gives us grand views of the twin pinnacles and the surrounding landscape. 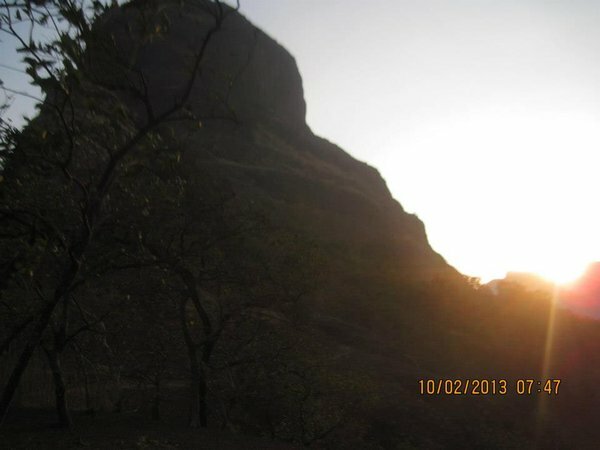 After descending this hillock we start the climb to the main hill of Gorakhgad. A moderate climb followed by a flat walk bring us to the base of the main pinnacle. It takes about 1.5hrs from the temple to the base of the pinnacle. Between these staircases are the beautiful and clean caves dug out in the heart of the pinnacle. Water tanks are located next to the caves. The panorama from the caves is dominated b the Macchindragad pinnacle with views of the Deccan Plateau forming a formidable backdrop. 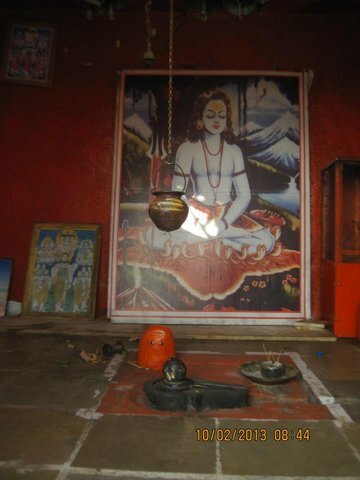 The top of the pinnacle has a small temple of Gorakhnath and a few ruins. Standing near the temple one can view the entire range of Naneghat-Dhakoba to the east, Ahupe ghat to the South and Siddhagad to the South-west. All these places are at a higher elevation compared to Gorakhgad and make for an awesome spectacle. Gorakhgad, a sheer rock of about 400 feet (121.920 metres) high, stands out from the Sahyadris at the foot of the Aupa or Khopoli pass and is about nineteen kilometres south-east of Murbad and about three kilometres from Siddhagad or Sidgad. In 1818 it had two forts, an upper and a lower. After a difficult ascent of about 100 feet (30.480 metres), in places along the break of the precipice, stood a gateway with an underground spiral staircase behind it, now almost in total ruins. There was a second gateway at the top of this staircase and above some water cisterns and huts, the latter of which do not exist now. From this a second steep and dangerous ascent of about 100 feet (30.480 metres) ended in a narrow terrace which was about ten (3.048 metres) to fifteen feet (4.572 metres) wide, with some large cisterns and caves useful for stores and dwellings running under a knob of rock about 100 feet (30.480 metres) high. A very narrow and difficult staircase hewn out of the rock gave access to the top. In Captain Dickinson's opinion, this upper fort was safe against any native power and could scarcely be captured by surprise. In 1862 it was ruinous with scanty water and no supplies. 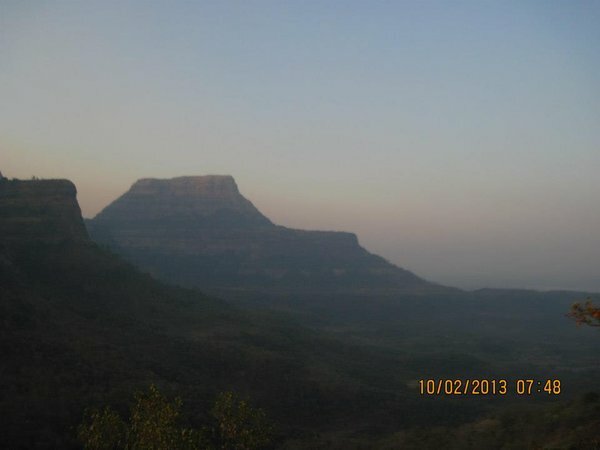 Not far away is Machhindragad, also an abrupt rock like Gorakhgad. These rocks are noticeable from the railway near Neral station. The caves and cisterns noticed by Captain Dickinson are the remains of an early religious settlement. At different heights and at irregular distances there are many small groups of caves most of which are dwellings like many of the Kanheri excavations. They have verandas, seats and square hewn pillars. The water in the cisterns is cool and abundant. Even now the supply of water is plentiful and the fort like others in the Sahyadri ranges is trespassed by shepherds and hitchhikers. Pics will follow in the next part. Local transport is available for Dehri from Murbad. It is recommended to take the 0030hrs bus from Murbad to Bhila which goes via Dehri. 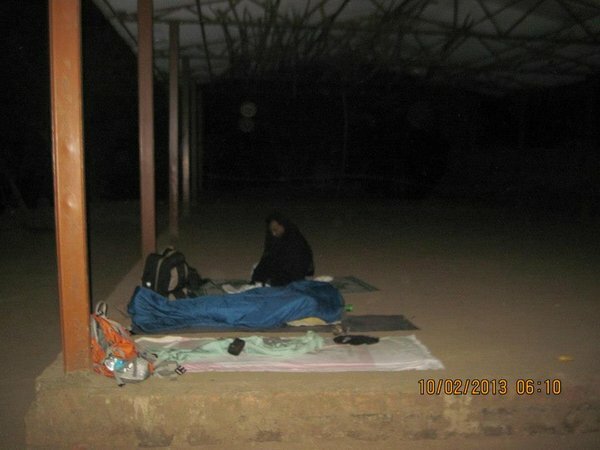 The trekkers can then spend the night in the Dehri Temple premises ans start at dawn to avoid the harsh heat. Night treks are also possible.